Civil Twilight by Susan Dunlap, a Mysterious Review. Darcy is reluctant to meet with Karen Johnson, a client of her brother, the lawyer, but agrees and takes an immediate liking to her. They make plans to meet for dinner, but Karen unexpectedly steals a police car — belonging to Darcy's other brother, the cop — which is later found in the parking garage of a building under construction. The police find Karen's body on the adjacent highway, an apparent suicide. Darcy knows Karen didn't kill herself — the body was too far away from the building if Karen had jumped — but neither of her brothers is particularly cooperative in helping explain her relationship to them. She proceeds to investigate on her own, following a single lead to a remote community in northern California and then on to Alaska, to learn more about the mysterious Karen Johnson and why someone would want to kill her. 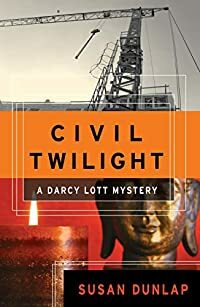 Civil Twilight is one of those mysteries that, despite a lot of action in the first chapter or two, starts slowly, methodically laying a foundation for what ultimately becomes a first-rate story. There would seem to be little reason for Darcy to pursue her investigation other than her desire to know what really happened … and why her brothers weren't being forthcoming about it. But it works here. Darcy's profession as a stuntwoman also serves her character well: she's known as a risk-taker, albeit a smart one, by her friends and colleagues. Still, at one point a detective on the case says to her, "Karen Johnson did something that got her murdered. I don't know what. But her killer's out there somewhere. Be careful. Seriously careful." There are a considerable number of twists and misdirections that keep the plot interesting, without unnecessarily complicating it, no small feat on the part of the author. Acknowledgment: Counterpoint Press provided a copy of Civil Twilight for this review.